So…I may have gotten a little head start on that beauty update. 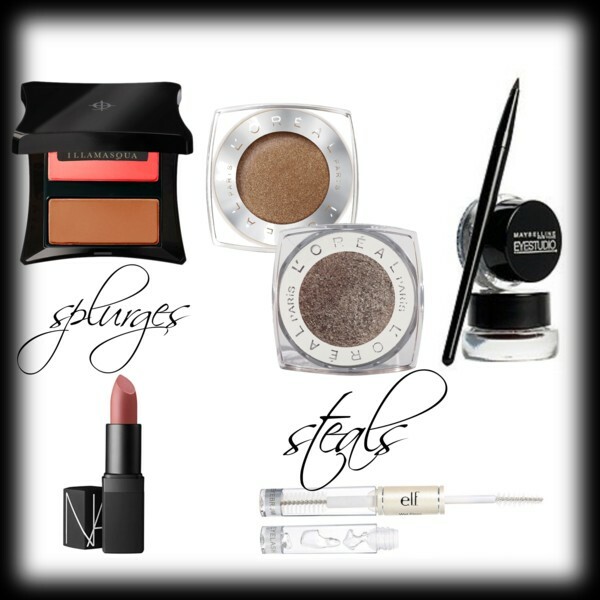 These items didn’t make it on my fall beauty wishlist since I had already recently purchased them. The splurges were courtesy of a gift card from a friend that had been languishing in my wallet. The steals were courtesy of a Target trip that was supposed to be just a “quick stop for bread”…you know, just like every single Target trip (at least in our household). Illamasqua Blush/Bronzer Duo in beg/bronze. The bronze shade looks downright crazy in the pan, but actually does a great job at contouring for my medium deep skintone (I wear NARS tinted moisturizer in either Malaga or Seychelles as my summer base color for reference). The blush is a great natural color that works for my skin now and the lighter tone I will become in a month or so. I’m still not sold on this product as I’m still a little skeptical about the bronze color (even though it works great). Perhaps I’m just being a tad bit suspicious about the disconnect between the color in the pan and the color on my face (and serious doubts about my ability to recreate whatever it was the makeup artist did in store to seduce me into coughing up my gift card). NARS lipstick in Dolce Vita. True to my neutral-loving self, I love me a great my-lips-but-better lipstick. I’ve been eyeing this lipstick for awhile but I’ve always passed it up before. It’s such a nice color that I know I’ll wear often, but I sometimes shy away from buying a lipstick that is a bit ordinary, you know? I know it sounds silly, and it is silly since I’ve used it far more often in the couple of days I’ve had it than the other bold lip colors I’ve had for months. Note to self: basics often become can’t-live-without-it classics. Sure, they’re not flashy, but they have a tendency of becoming essential. L’Oreal Infallible 24 Hour eyeshadows in Amber Rush and Bronzed Taupe. I know I’m late to this bandwagon, but I’m now shamelessly on it. These colors are beautiful and apply like a dream. At ~$8 a pop, these are gorgeous shadows to add to my stash with (relatively) little guilt over the price. I’m just sticking to two for now though – $8 x goingcrazy = a lot of money. Maybelline EyeStudio gel cream eyeliner in blackest black. Again, another party I’m late to. The Illamasqua makeup artist used the brand’s gel creme liner on me, and I loved the effect. I balked at the $28 price tag for theirs, so I went digging on the web to find something more wallet-friendly. This one was recommended by so many, and after trying it, I now see why. It’s got great pigmentation, is easy to use, and the brush isn’t bad. I prefer using an angled brush more so than the pointed one that comes with it, but it’s a nice addition. I don’t know about drying out issues yet as I just got mine, but I closed the lid tightly on the jar and am hoping for the best. E.L.F. clear mascara/eyebrow gel. Ah, the biggest of steals. This baby was $1. I’m an eyebrow gel newbie, so even though this product got mixed reviews online (many complained of the relatively small amount of product and of the gel looking discolored over time), I figured it was a good place to start. For $1, it was worth a try and if the product does start looking unpleasant, it could be thrown out and replaced at a very low cost. It does a good job of helping my eyebrows stay put, so at least in the short term my $1 was well spent. I love that NARS lip color!